Description: Designed and constructed an electric cello incorporating basic principles of cello ergonomics, acoustic physics, and audio frequency electronics. - Presentation of final product. Project lifespan: 3 months, Feb-April 1998. 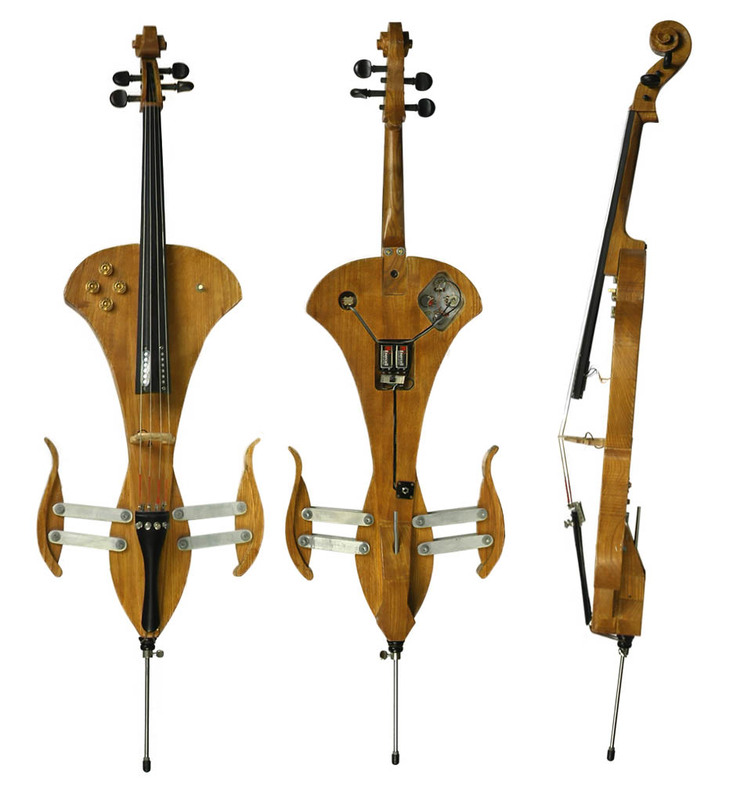 The shape and body of the electric cello was modeled after a regular full-size acoustic cello. An acoustic cello was available to use as a precise template to follow. 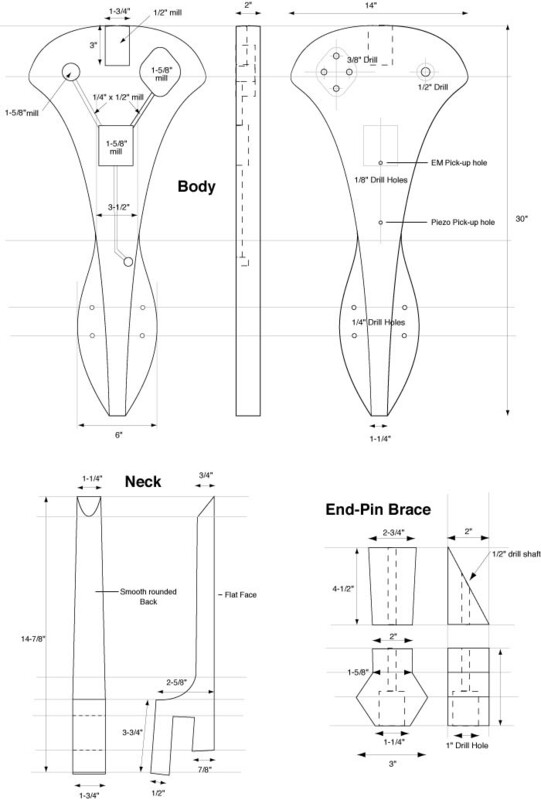 Four major factors influenced the final body design: Weight and strength, Form and Comfort. The wood type used was ash, which is very hard very dense wood material providing a solid base for sound resonance. However, making a solid cello of ash would be extraordinarily heavy. So, the body shape was streamlined reducing the weight dramatically. The strength of ash permitted us to thin the abdomen of the body without concern of breaking under the string tension. 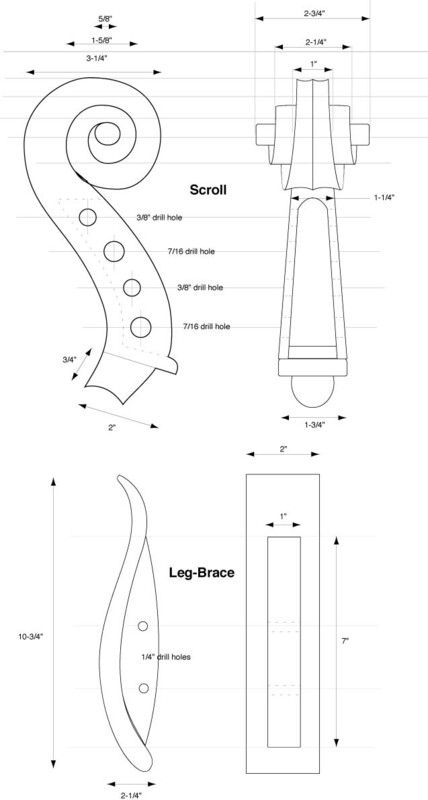 A cello body must withstand over 300lbs of compression between the nut and the end-pin. 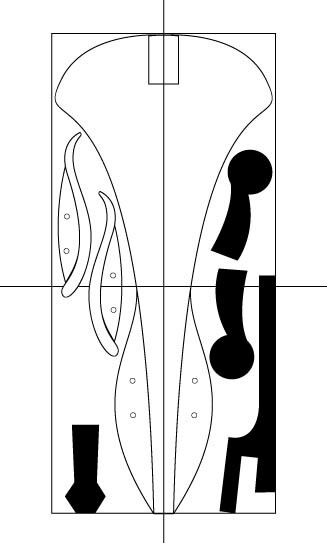 The body profile of a cello is critical to a player's ability to hold the cello securely while playing. Deviating from any convention that alters the functionality and feel of the cello would make it difficult for a traditional player to use this instrument. Therefore, we decided to use conventional cello parts where we could, keeping the operation as familiar as possible as well as reducing the construction work required. All of the pieces that are black are recycled ebony parts from older cellos. 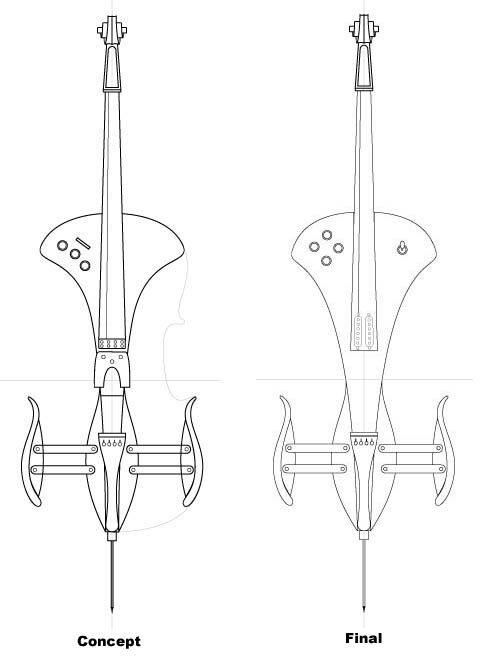 The adjustable leg braces match the profile of an acoustic cello exactly, while permitting the player to adjust the height for comfort. Each curved leg brace is attached the main body by 4 aluminum arms which keep the legs parallel to the body at any height setting. A cellist from the Charlottesville Orchestra that we invited to play the instrument at our final presentation, commented that "this is the most comfortable cello [he has] ever played." There are two types of pickup electronics embedded into this cello design: electromagnetic and piezo. Two standard guitar pickups are recessed into the ebony finger board near the bridge placing them at the point of greatest string movement. The two pickups are wired together in parallel and in opposite polar orientation. Since the electromagnetic pickups are simply coils of wire, they are highly sensitive to any ambient magnetic fields, such as those created by 60Hz AC room electrical wiring in rooms. Connecting the two pickups in opposite polarity cancels out any ambient interference or "hum" received at both pickups. The formation is called "humbucking." The second type of pickup resides inside the bridge. The piezo crystal is placed underneath the arm of the cello bridge and is sensitive to physical vibrations. The oscillation of the strings causes the bridge to rock back-and-forth around its center, squeezing the piezo pickup as it vibrates. Because the body of the cello is solid ash, any vibrational energy that is goes to the feet of the bridge gets reflected back up into the top half of the bridge. This enhances the activity on the piezo pickup. Since the electromagnetic pickups and the piezo pickup function on different principles, the impedances of the devices do not match. The signal from the piezo element has to be amplified before being mixed with the signal from the electromagnetic pickups. Otherwise, the weak piezo signal will be lost. This is done with a simple operational amplifier and two 9V batteries. Battery lifetime is about 6 months under normal usage. Once the two signals are on equal ground, they are sent to a small mixing circuit which modify the "tone" of the sounds from each pickup and their relative volumes. There are a total of four adjustment knobs, two volume and two tone knobs. Tone knobs control how much "twang" is transmitted by adjusting a low-band pass filter. Low-band pass filters only permit low frequency sounds to be transmitted by reducing the volume of high frequencies. A 3-state switch on the left side of the cello allows the cellist to decide which pick-ups to use. The electromagnetic pickups produce a very different sound from the piezo pickup, so some form of control is desired. The player may use the piezo pickup, the electromagnetic pickups, or both simultaneously. The switch positions correspond to the relative position of the pickups (down = piezo, middle = mix, up = electromagnetic). Once the signals have been amplified, adjusted, and mixed, they are ready for output to a guitar amplifier or effects pedal. The output jack is a standard 1/4" mono instrument plug positioned near the bottom of the cello and off center so that the endpin (that supports the weight of the cello at the bottom) can be retracted and not interfere with the plug. This instrument has since been used for several small musical performances and presentations to introductory engineering classes.